Maybe I’m more churchy than I thought, but the christological references in the blockbuster “Man of Steel” was so overwhelming is pushed the movie from epic to cheesy. This was not “The Dark Knight” which in my opinion still outranks this latest genre of Hollywood revisiting the comic classics for the sake of getting me to slap down $16 bucks to see the movie in IMAX and to see it in 3D. But again, what really got me was the overwhelming almost in your face christological and messianic associations with Kal-El, better known Clark Kent, who is, of course Superman. First, for the sake of this piece, let me define my secular usage of the words messianic or christological. Messianic obviously refers to some messiah character, the one who has the ability to save or liberate humanity, from the Hebrew word מָשִׁיחַ transliterated as “massiah”. Consequently, it also means “the anointed one” from which the Greek, in the Christian New Testament translates as Χριστός, with a transliteration of “kristos.” This is to say, “Christ” is not Jesus’ last name, but really a title. Jesus’ name in the Jewish community in which he was living was no doubt Jesus, son of Joseph. This suggests that anything can have a salvific or “christ” title attached to it. There isn’t some grand spoiler to this, because we all know the story of Superman, and I guarantee you, not much has changed, but if you’re totally scared that I’ll ruin the movie for you, this would be a good time to stop reading and take this as you SPOILER ALERT. Kal-El, let’s call him by his real name, is sent to Earth to be a savior for the race of humans on that planet. It doesn’t take a rocket scientist to figure out that that’s a Jesus reference. All throughout the biblical narrative there is this hope for a prophet, a great prophet that will rescue and save the Jews. Through the prophets beginning with Abraham, through David, through Isaiah, through Jeremiah, through Hezekiah, through Ezra and Nehemiah, they all end with Jesus, being this superman figure who transcends reality and normal belief. Much like Mary and Joseph, Jonathan and Martha Kent receive this child when they have none of their own and actually raise it. Some hearken it back to the story of Moses being shuttled down the river as Kal-El was shuttled through space to arrive unknowingly at a place that was willing and able to receive him. The codex is an ancient Kryptonian artifact that decodes the genetic makeup of the artificially incubated babies on the planet. Forgive me as I dig deep into Christian lore to make the connection here. This codex has the ability to recreate Kryptonians as predestined creations, designed for a specific purpose free of free will and self determination. Similarly, while Jesus’ character has free will, it is still tied to the mission of why he was sent; same as Kal-El who’s will to just move in and about humanity helping out as he pleases, he does know that one day there will be a moment in which he will have to no longer be Kal-El, no longer be Clark Kent, but indeed be Superman. Humanity, according to Pauline doctrine, and early church father’s doctrine that interpreted Paul have humanity as being “slaves for Christ” as the Petrine epistles talk about humanity being “God’s slaves” which, I say, is the same as the codex predetermining one’s destiny. Like I said, I was reaching deep for this one. He was 33 years old at the time all of this was taking place. Most scholars accept that Jesus at the time of his death was around the age of 33 and people generally accept that he was 30 years old at the start of his formal ministry as recorded in the four canonized gospel accounts give or take a few years. Granted in the original comic book, Clark Kent was not given an age, some cited 29 a bit later, and toward the more recent publications, he was listed at 35. Nevertheless, the age of 33 was a clear nod to Jesus’ age. More than once, the archetypical image of a crucifixion was displayed by Kal-El. Most notably as he fell into the water from the oil rig. Or perhaps that was just me reading too much into basic symbolism. Not to mention, Kal-El did stop by a church once General Zod had given the warning that Kal-El must surrender to prevent the destruction of Earth. It was an interesting look into his mind as he was coming to grips with being a messianic figure, one to save the world indeed. It may be safe to say that the original creators of Superman, two Jewish men, Jerry Siegel and Joe Shuster, were intent about the religious undertones. It wouldn’t be a stretch that they would know what קל-אל or Kal-El means, and clearly the “voice of God” this name usually associated with the tetragrammaton (meaning four letters), or יהוה‎ which we recognise as YHWH or YaHWeH, is one of the utmost reverence in Jewish culture. The voice from the burning bush with Moses speaks and identifies itself as “the conjugation of the verb to be” is speaking, the real deal Kal-El is speaking. Reading the Bible with a distinct hermeneutic of suspicion, I certainly take some of the dogmatic principles with a grain of salt at times. The story arc of Superman is clearly to save humanity from these clearly otherworldly outside forces that seek to kill and destroy that fabled phrase “life as we know it.” It’s always some scary end of world as we know it moment that Superman swoops in and literally saves the day, because tomorrow was soon to be canceled. But this fits the Jesus (God) versus Satan and Hell and whatever anti forces one can conjure up and Superman versus General Zod, Braniac or Lex Luthor all satisfy that basic good humanity versus bad humanity plus bad otherworldly creatures. Did you ever notice that the American superheroes generally have amped up American exceptionalism to global exceptionalism American style? I’m pretty sure that across the board from Marvel to DC that there are more enemies on other planets than planets with friendly allies. It’s this whole set up of us vs. them that has plagued humanity since our creation. Now, I understand the context of which Superman was created, and he was really an uber liberal superhero that seemingly was for racial parity and social equality, but he was also an American hero who thrived under “the liberal idealism of Franklin Roosevelt’s New Deal” according to Roger Sabin, a comic book scholar.1 This plays into the concept that Siegel and Shuster, being Jewish, were intentional about creating Americanism. Another author Timothy Peevy made the argument that these two created “an immigrant figure whose desire was to fit into American culture as an American.”2 Superman indeed, is as American as apple pie. The response to the question posed is rather basic: what do we need saving from? The movie answers it rather succinctly: there are otherworldly forces of which we have no real control over; we can’t will or wish them away. In turn, we need another supernatural advocate operating on our behalf to save us from their wily attacks. The movie didn’t explore, nor did I expect (or want) it to, what does it mean when we need saving from ourselves. The older I get, the more I begin to find myself steeped in basic humanist beliefs and philosophies that place much of the onus of the ills we face squarely at the feet of humanity. To me, a savior is a distraction at worst, a guide at best. As in the Gospel of John, the miracles Jesus did were actually called “signs” which I think we gloss over far too often. In the study of semiotics, it’s clear that signs do exactly what we know them to do: they point to something different, maybe greater than the sign itself. Pulling from the Christian mystical tradition, I remember sitting in class and the professor Dr. Luther Smith, teaching a class on Howard Thurman explained that Thurman very much viewed Jesus as the one who must have made it to the moon. That is to say, imagine a ladder stretching from Earth to the moon, and it very quickly and clearly disappears from sight. That the moon is the goal, metaphorically speaking heaven or nirvana or a state of pure holiness as we know it. It is in that instance that the personhood of Jesus had moved so far up the ladder that he passes from sight, and our only assumption is that he must have made it. This description of Jesus, a mystic, works for me because Jesus acts as an agent that is pulling humanity along a path to a higher recognition of it’s place in the universe. Maybe, just maybe, the personhood of Jesus was sent not to save us from some otherworldly force, but rather to save us from ourselves. His embodiment was so powerful that we still talk about what he did, and what he allegedly did so that we have an exemplar of what we can achieve as a human race. 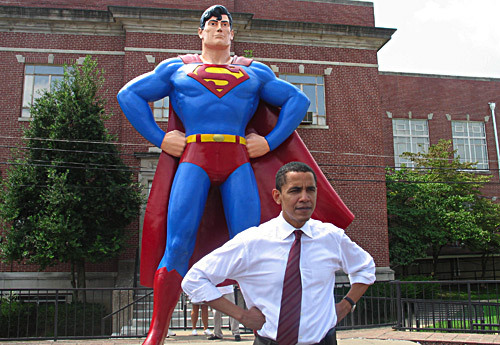 So for me, America’s belief in Superman is a religion in an of itself, it’s Americanity. This Americanity has us focused on the wrong thing: outside forces when indeed much of what we need to we can do ourselves. Rather than “waiting for Superman” we can change the world ourselves. We know what we need to do and what needs to be done, we know our limitations and we know our strengths, and I be damned if we don’t have a lot of strengths both individually and collectively. Of course, I’m not the only one who’s noticed this glaring christological parallel in this particular installment of telling the story of Superman, but I think what bothers me is the level to which we as a society so easily accept what’s placed before us. There is a multitude of articles that highlight this, here’s a snippet from one. 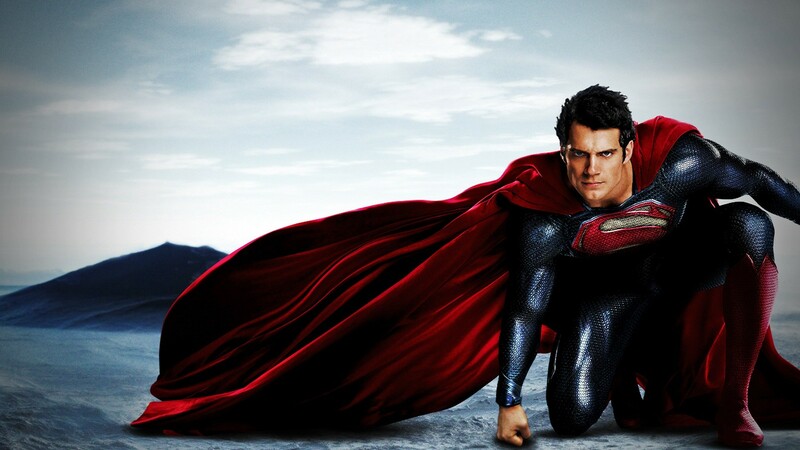 With its popular comic book genre appeal, stellar cast led by British actor Henry Cavill and a slick marketing campaign, the new Superman film, Man of Steel, was always expected to be a box office hit. But the record-breaking weekend was in a large part thanks to interventions from America’s mega-churches as the congregation flocked to the cinema after hearing the word of Superman from the pulpit. The film took in $125 million (£80 million) over the weekend across America, the biggest June opening in cinema history and one of the biggest openings ever. Warner Bros, the studio, had thrown the usual full weight of its marketing machine to promote the blockbuster. But there was a less obvious promotional product tie-in – pushing the spiritual themes of a secular film to a Christian market. Warner Bros employed Grace Hill Media, a public relations firm focused on the Christian market, to arrange screenings for pastors, supply churches with free film clips and even draft sermons that draw on themes in the film that can be given a Christian interpretation. Grace Hill Media has promoted about 300 films through more than 150,000 ministers. “I don’t know if you’ve seen a contemporary church service lately but they’re pretty big, modern places with lots of TV screens, definitely not your grandfather’s church with an organ,” said Jonathan Bock of Grace Hill, who is a lifelong Christian. I’m not opposed to using movies as a way to preach or convey a message, they’re like ready made metaphors ripe for the picking, but its a different story when marketing tactics are used to the point that they co-opt the belief system just to increase market share. I guess we’ve come to expect that from big businesses and corporations, including Hollywood production companies. I think what’s more sickening about this arrangement is the level to which the American religious community falls for this hook, line and sinker. But I guess that goes to show you just how much Americanity and Christianity are considered one and the same. But let’s cut the charade and say how we really feel: we need an American savior to protect our way of life, to protect our things. Knowing that there is some supernatural force out there that knows our first world struggle and will fight to make sure that we can keep our DVRs, our flatscreen TVs, our two car garages, our summer homes, our option for private schools, our way of life is what helps us sleep at night. We, the American people need a savior, we can call him Jesus, or Superman, it really doesn’t matter both accomplish the same goal: someone to save our way of life rather than save us from ourselves. So, lift those dirty hands and give Jesus Superman some praise! C’mon why don’tcha give God a praise and bless America! 1 Sabin, Roger (1996). Comics, Comix & Graphic Novels (4th paperback ed.). Phaidon. ISBN 0-7148-3993-0. Thanks Uppity. Lord have mercy on us all. I like your Americanity that shows many Americans have substituted the true Christianity for it. They called themselves Christians but in reality they practice Americanity. D.A.D. Very interesting perspective. I would agree with the fact that there are christological references in the Superman story; however, this is nothing new. There are tons of films and books of fictional stories with Christian undertones, metaphors, and analogies. I do t see this as a direct opposition to or distraction from Christianity (as all Americans are not Christian). I do think that it speaks to a need in our society to submit to or believe in a higher power. We can look at the world and all its issues that seem insurmountable and not question why anyone wouldn’t want some great force to come and save the day. I agree with you on the point that we cannot have what I call “The Messiah” complex where we all sit and wait to be saved ignoring our own ability and power to create and influence change. But in many of the stories that I can think of this concept is usually captured there (I.e. The Matrix, The Lord of the Rings etc.). While I don’t believe the character and story of Superman is a religion in and of itself or a threat to Christianity, I think this post was passionate, insightful, and well written. Respect. Again, very insightful and well written. Respect. To say that DC’s Comic Book Superman is a religion is hyperbole. There is no growing or established religious cult that worships this character for obvious reasons. And quite frankly, I find it extremely boring that Christians in particular write articles that mildly or even vehemently “condemn” the comic book character as if it is a threat to their Jesus Christ/Christianity. How ridiculous, how boring, how boorish and inane. If Christians believe the movie industry is finally going to crank out “Christian movies” on a large scale basis to satisfy their preferences, then, that amounts to lack of critical thinking (no surprise there) and the lack of initiative to produce your own Christian genre of movies. Any reasonably clear-thinking person would acknowledge that the movie industry will use any religious analogue of the supernatural via special effects to get more customer viewership. Money and profits, people. There is no misuse or co-opting of the Christian message here. This movie is about Superman, not, Jesus Christ the Nazarene. Again, where are the naysayers’ common sense and critical thinking? 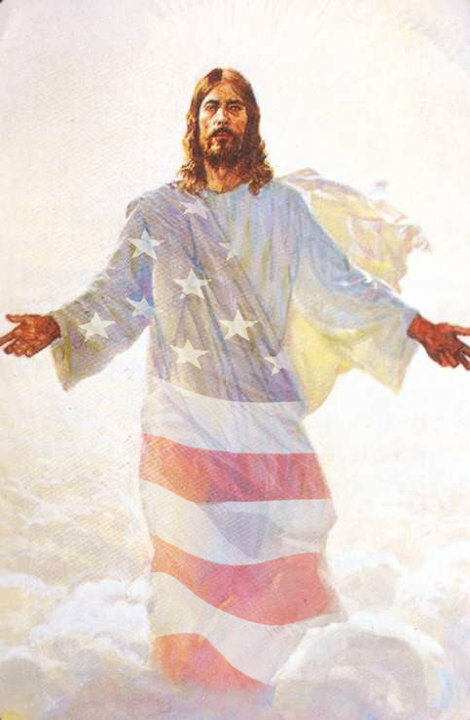 The need for an American savior, thus DC’s Superman or the New Testament’s Jesus Christ? That’s what the American public needs? Don’t hold your breath. American would do well to start thinking clearly instead of reacting (overindulgence in emotional tirades). Better to act (strategy and tactics) based on the present reality than indulge in waiting on someone else to solve a problem or to do the thinking for you. When I think of the Super-Man, I think of me. How am I going to solve the challenges I face day and night? By using strategies, tactics, critical thinking, collaboration with others, finding the resources, utilize the character traits that are my strengths such as tenacity, persistence and insistence, positive self-talk, confront my fears, acquire a mentor, recognize opportunities until I have some form of victory or resolution over the challenge. For a person to be diligent in these matters reveals the superhuman excellencies of a Super-Man. I know that when I get up in the morning and look at my reflection in the mirror that I’m the only Super-Man I’ve got, so I carry out the tactics of the day that are required and I expect incidences of good fortune to take place in my life. And from time to time I’m able to recognize, perceive and appreciate when events of good fortunate occur. I’m so grateful. Don’t blame DC’s Superman for the human weaknesses of wanting to luxuriate and recline while the world around them that they support is going to hell. After all, humans are consistent in creating hell on earth and wanting someone to clean up the mess for them. What shameful human weakness. A mystical Jesus Christ? I don’t think that’s a good thing either. Most Americans are not familiar with that kind of idea, they couldn’t explain it to you. That idea is much to sophisticated a concept for the typical American mind to grasp. However, the same ignorance applies to working with reality, which is where the problems humans are facing now are apparent. Humans are not and can not be equipped to deal with the problems that might exist in some other-world. It’s time that a balance of priorities should include being honest and timely in solving problems in this-world.